"Hillary Step", a near-vertical 12-metre-high rocky outcrop at Mount Everest, was named after Sir Edmund Hillary who, along with Tenzing Norgay, reached the summit in 1953. "Hillary Step" rock face near Mount Everest summit after it had collapsed. London: A near-vertical 12-metre-high rocky outcrop at Mount Everest called the "Hillary Step" by mountaineers has collapsed, making the climb to the world's highest peak dangerous and lengthy. "Hillary Step" stood on the mountain's southeast ridge, and was the last great challenge before reaching the top. The rocky outcrop was named after Sir Edmund Hillary who, along with Tenzing Norgay, reached the Mount Everest summit in 1953. 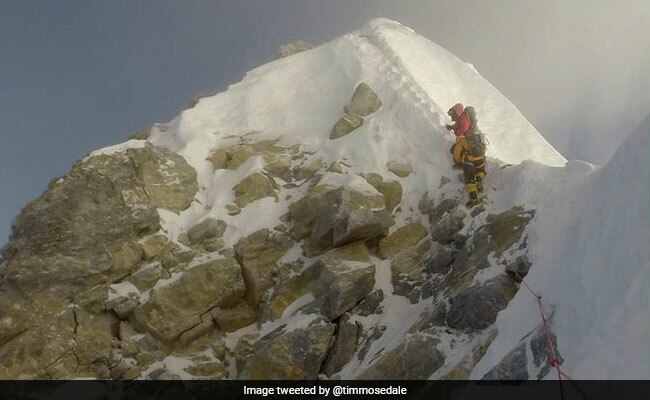 The loss of "Hillary Step" was the "the end of an era", British mountaineer Tim Mosedale wrote on Facebook after reaching the summit on May 16. "It is associated with the history of Everest, and it is a great shame a piece of mountaineering folklore has disappeared," Mr Mosedale wrote. "It was reported last year, and indeed I climbed it last year, but we weren't sure for certain that 'The Step' had gone because the area was blasted with snow," Mr Mosedale wrote on Facebook. "This year, however, I can report that the chunk of rock named 'The Hillary Step' is definitely not there any more." Mr Mosedale believes the 2015 Nepal earthquake broke 'Hillary Step', the BBC reported. "It's official - The Hillary Step is no more. Not sure what's going to happen when the snow ridge doesn't form because there's some huge blocks randomly perched hither and thither which will be quite tricky to negotiate," Mr Mosedale wrote on Facebook. Mountaineers say the snow-covered slope will be easier to climb than the vertical rock face, but loose rocks could still slow down progress. They say taking more time to reach the summit means having to wait at the bottom longer, which could lead to a life-threatening situation for mountaineers already battling low oxygen and frostbite a few hundred metres away from the top of the world.